On Barbados’ tony west coast, the grand Sandy Lane currently reigns as “the” luxury stay on the island. But located just a mile or so down the road, hidden between a few private villas and Parlour-fave Tamarind lies one of the island’s chicest private resorts, The House. Mix the famed service of the Ritz Carlton with the casual luxury of The Mondrian, place it in Barbados and you get The House. Upon walking in, you are immediately in one of my favorite places on the island – The House’s Living Room Lounge. It looks a bit like an all-white clubhouse, on chocolate covered wood floors with splashes of blue, anchored by a famed rum bar that attracts privacy-craving celebrities and the island’s cool elite, including the island’s own Rihanna herself. After checking in and receiving your complimentary jet-lag massage, hang out in the Living Room or on the beachside deck – everything within a short walk from each other as the property boasts only 34 suites to preserve the intimacy. And if you’re hungry, walk over to Daphne’s, the hotel’s Italian restaurant, the Caribbean sister of it’s London counterpart. If you are visiting for a special occasion, you can arrange for beach-side dining if you want to make the experience truly memorable. Features such as beach horseback rides, massages and spa treatments round out your stay, and judging from the reviews—keep you coming back. 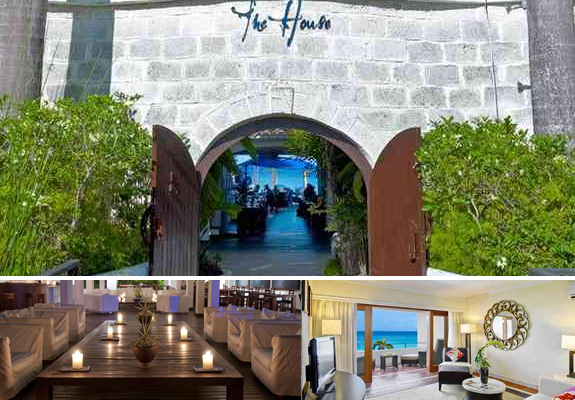 Currently, The House is ranked number one among the twenty-six hotels found in St. James (to include Sandy Lane), joined by fellow Elegant properties Colony Club and Tamarind in the top ten. During the Food Wine Rum Festival, it’s common to see the world’s top chefs and their company tasting rum at the bar or hanging beachside, which is how I discovered it in the first place. Blink and you’ll miss it, but when you enter you may never want to leave. Interested? Suites start at $500 per night, but if you are joining us in November for the Food Wine and Rum festival, use Parlour’s code for an automatic 20% discount your total stay. More information can be found here – treat yourself – see you in St. James!